Use the powerful photo editing features in Photo Studio PRO v1.21.2 along with your creativity to make your images stand out. December 29 update brings you all new filters, effects, stickers, frames, plus some bug fixes, and much more. - 150+ unique filters in categories: 'Lomo', 'Vintage', 'Simple tone', 'Black & White', 'Old Style', ‘Cold tones’, ‘Warm tones’ and 'Art'. - 200+ amazing special effects: shadow, fabric, akvarel, rust, frames, scratch, light, fire, water, heart, brush, noise and many more. - Artistic filters Sketch and Watercolor enable you to turn pics into beautiful works of art. - Picframes helps you combine multiple photos into amazing looking frames with 100 adjustable templates in Classic and Art categories, adjustable borders, frames, corners and backgrounds. - Powerful collage making tool for creating free-form collages. - Color Splash FX with filters: decolor, colorize or recolor your shots. - About 50 free stickers and about 1000+ stickers in additional packs by categories Animals, Romance, Plans, Monsters, Food and many more. 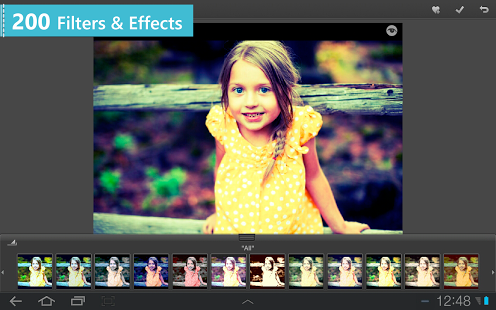 - Magic Tools contains: Auto-Levels, Sharpening, Area-Auto-Levels, Blurring and Red-Eyes correction. - Clone Stamp tool – easily choose and reproduce particular areas of your image. A must-have photo retouching tool. - Lens Boost – get an amazing vignette effect with circle and linear (Tilt Shift) lens. 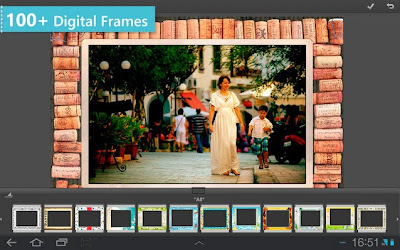 - Apply set of beautiful digital frames to your photos. Available packs: Holiday Frames, Christmas Frames, Summer Frames and Valentine's Day frames. You can download and try all frames..